Vases are always prized as a centerpiece. They hold bouquets and complement the floral arrangement with their own design, fluid lines and stability. Forget about the vases you know, and open-up to a whole new and exciting concept. VAZU takes design to a new level,offering a trendy conversation item,brimming with fresh ideas, just like a bunch of newly cut flowers. It is so "out of the box" - it's flat like a paper , but once you touch it, open it and fill it with water - you are inspired by the ingenuity. Vasu is made of mainly Polyethylene and Polyester. It is important to emphasize, we are not using PVC which in recent studies proves to be an unhealthy material. It is a high quality product. It can last for years without tearing or leaking. The art prints are trapped between material's layers so they cannot scratch or fade. It is so strong that it is almost impossible to tear it with your bare hands. 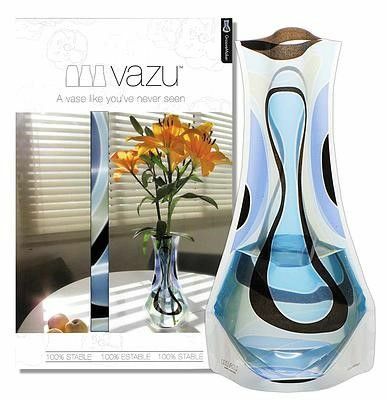 During production, the vazu™ was tested under conditions of pressure (5 atmospheres) so it shouldn't leak in normal use. It is very stable and most often more stable than an equivalent glass vase. The weight of the water makes it sit tightly on any flat surface and the flexible body can absorb hits that will usually cause a glass vase to tip over.